Satisfy your hunger by adding All Season Dining to your Season Pass. For one low price, enjoy lunch and dinner every time you visit all season long. 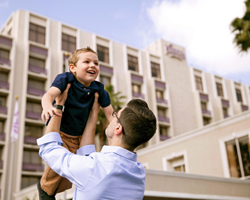 Regular Passholders with All Season Dining may dine at up to 14 locations in Knott’s Berry Farm, and Gold and Platinum Passholders with All Season Dining may dine at 16 locations throughout Knott’s Berry Farm and Knott’s Soak City Waterpark. It pays for itself in just four visits! Valid admission to the park(s) where All Season Dining will be used is required. Valid Jan. 1, 2019 - Dec. 31, 2019. Choose between the All Season Souvenir Bottle or go bottle free with the Season Pass Drink Plan and refresh every visit in 2019 with unlimited drink refills* for one low price. Enjoy refreshing Coca-Cola beverages throughout Knott’s Berry Farm and Knott’s Soak City Waterpark including Coke, Diet Coke, Boysenberry Punch, Minute Maid Lemonade, iced tea and POWERADE all season long! *15 minute interval time between refills. Valid admission to the park(s) where the souvenir bottle or Season Pass Drink Plan will be used is required. Valid Jan. 1, 2019 - Dec. 31, 2019. One of the best ways to experience the Boysenberry Festival is with a Tasting Card! Enjoy your choice of eight tastings of the following items: Boysenberry Chili, Boysenberry and Lemon Hummus, Boysenberry Dry Rubbed Flank Steak, Boysenberry Elote, Boysenberry Jerk Chicken Wings, Boysenberry Sausage, Boysenberry BBQ Chicken Skewers, Boysenberry Pot Roast, Boysenberry Glazed Salmon, Boysenberry Jambalaya, Boysenberry Pulled Pork Tostada, Boysenberry Habanero Baked Mac and Cheese, Boysenberry Waffle, Boysenberry Cinnamon Sugar Tortilla Chips & Ice Cream. 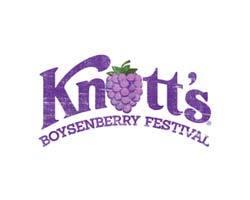 Valid during the 2019 Knott's Boysenberry Festival (March 29 - April 28). Not valid for park admission. With the All Day Dining Plan, you’ll never go hungry, and you’ll save a bundle all day long. Enjoy an entrée and a side at any of the 16 participating locations throughout Knott’s Berry Farm or Knott’s Soak City Waterpark. Best of all, there’s only a 90-minute wait time between meals. Stay fueled for the fun all day with the All Day Dining Plan. Valid admission to the park(s) where the dining vouchers will be used is required. The Single Meal Deal includes one entrée, side and a regular size fountain drink at any of the 16 participating locations throughout Knott’s Berry Farm or Knott’s Soak City Waterpark. Enjoy refreshing Coca-Cola beverages all day long and get FREE refills* on your first visit! Plus, pay only $1 (taxes included) for each refill whenever you visit again during the 2019 season. *15 minute interval time between refills. Valid admission to the park(s) where the souvenir bottle will be used is required. Valid January 1 through December 31, 2019. 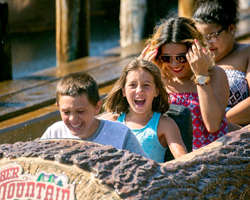 Visit Guest Services at the park and for a $5 replacement charge your bottle can be replaced. The barcode on the lost/stolen bottle will be deactivated so that it can no longer be used, and you can start to use your new bottle immediately. Deactivation and replacement can only be done if the All Season Souvenir Bottle has been added to a valid Season Pass, and can only be requested by the pass holder. Souvenir bottles not associated to a Season Pass cannot be deactivated and replaced. If you lose your Season Pass, Guest Services can help you replace your Season Pass card for $15 and activate the Season Pass Drink Plan on your new pass. If you forget your Season Pass, please stop at any ticket window located at the Front Gate. With proper identification a temporary pass will be issued to you. The temporary pass is only valid for that day and will have the Season Pass Drink Plan attached. Only two temporary passes are allowed per Season Pass per year. The Season Pass Drink Plan can be added to all Season Pass types, except Knott's Scary Farm passes. 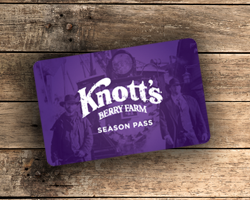 You can use these on any public operating day, and the programs are valid for the regular season, as well as Knott's Scary Farm.